For most seniors today, there is no denying that a strong immune system can be the key to living a long, healthy life. The immune system is essential to fighting off diseases and other illnesses that may jeopardize their overall health and well-being. Unfortunately, many seniors suffer from compromised immune systems, and their immune systems tend to only get worse with age. The good news is, there are several ways that any senior can boost their immune system and start getting the disease-fighting power that they need. One of the best ways for seniors to do this is to eat the right foods and fill their bodies with nutrients it needs to be its healthiest. Many times these immune-system boosting foods can come in the most surprising of forms. Here are a few immune-system boosting foods that may surprisingly help seniors boost their immune system and start getting healthier. All-natural Greek yogurt (not the sugar-filled yogurt options that come with candies and artificial coloring) is a great food to help boost the immune system. Whether seniors eat it for breakfast or as a snack, this yogurt is powered with healthy bacteria that can help keep the gut and intestinal tract healthy, plus it’s packed with vitamins and nutrients that can help any senior’s entire body stay up and functioning in the way it should be. 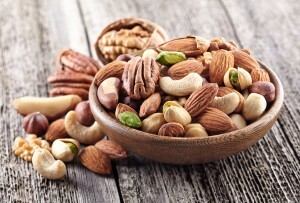 Many people shy away from nuts because they are filled with fat. However, nuts are actually brimming with good fat and the type of fat that the body needs in order to stay healthy. In addition to having several heart-healthy benefits, these nuts are also brimming with nutrients that can boost the immune system. This includes protein, antioxidants, vitamin E, zinc and omega 3 fatty acids. This makes that handful of unsalted nuts a power-packed snack any senior can enjoy. Garlic is not only a popular cooking herb, but it is a great antioxidant-filled power food as well. In addition to having both antibacterial and antiviral properties, garlic has actually been shown to help stimulate white blood cell production. The best thing about garlic? It is easy to add to everyday dishes from poultry and meats to vegetables and salads, making it an easy addition to any senior’s immune-healthy diet. This is perhaps the most surprising food on the list and one that is sure to make any senior happy. All natural cocoa is actually a very concentrated antioxidant. It not only fights off free radicals but it can help boost the immune system. This doesn’t mean eating sugar-filled chocolate every day, but it can mean adding cocoa powder to smoothies or having small amounts of natural dark chocolate. Just make sure that seniors aren’t over-doing the sugar. One of the best things about mushrooms is that they are a very easy addition to any diet. Just mix mushrooms in with any dish, including stir fry or soup, or try them as a side dish and seniors can instantly get the immune-fighting power they need. Mushrooms are filled with antioxidants and vitamins that can help fight off all types of everyday illnesses, and they are packed with antiviral and antibacterial properties.